Number : Season 4, episode 9 of 9. Which One : The Dalek/human Factor! First UK Broadcast : 20 May – 1 July 1967. Length : 7 x 25 minute parts. Plot : An antiques collector called Edward Waterfield steals the Doctor’s Tardis to force the Doctor to work for his employers; the Daleks; in testing a new emotional upgrade to the Daleks. Whats good : The natural continuation of the Dalek story. The experiments into human emotion. The Dalek Emporer. The human Daleks. The Dalek civil war. Whats bad : Long adventure. The Maxtible character. Playful Daleks maybe? Review With Spoilers : The Evil Of The Daleks is the 9th episode of season 4 and features the second Troughton Dalek reprise and the joining of new companion; Victoria. Following the events in The Faceless Ones, the Doctor is looking for the Tardis; which is stolen from Gatwick Airport – by Victorian time-travelling antiques collector; Edward Waterfield. Waterfield – in the enforced employ of the Daleks (who have kidnapped his daughter Victoria), wants the Doctor to work on a Dalek experiment. To test if the Daleks could benefit, from the introduction of human emotions; to make them more unpredictable. The Doctor agrees to this – reluctantly. The Daleks then set up a field-experiment, to use Jamie as a test-subject, to measure and test his human response; as to how he reacts when given a dangerous mission of rescuing Victoria – from her prison cell. The Evil Of The Daleks, forms the next logical step in the Dalek story; with the Daleks looking into whether they could benefit from human emotions – to improve their condition. Following their previous failed invasion attempts in The Dalek Invasion Of Earth and The Daleks’ Masterplan. Indeed, there is some reason to believe that a Dalek that can think “outside of the box”; might be a greater asset to the legions of Skaro. However, the end result of this, (humourously) is the Doctor’s experiments turning his test Daleks into uncommandable and playful young children – who spin around for fun and chase each other around whilst playing tag. It is a contritely silly and humourous moment in The Evil Of The Daleks, watching these Daleks do a conga around the room for fun. However, there is still something creepy about a Dalek calling someone “friend”. This brings the Daleks around to understanding that the “Human Factor”, as it is known – is not going to benefit the Daleks and in turn leads them to instead decide to contaminate Earth with “The Dalek Factor”; which will turn all humans into mindless automatons. We are also get a trip back to Skaro, to see the Emporer Dalek itself – a memorably giant sedentary tower of a Dalek; attached to pipes and wires and with a booming voice. It is something we haven’t seen before – in Who. The Doctor even blurs the line between good and evil, by agreeing to help the Daleks. This sets up some nice moments with bemused companion Jamie, who confronts the Doctor as to his intentions; which turn out to be playing for time. The Evil Of The Daleks also marks the introduction of new companion; Victoria Waterfield. 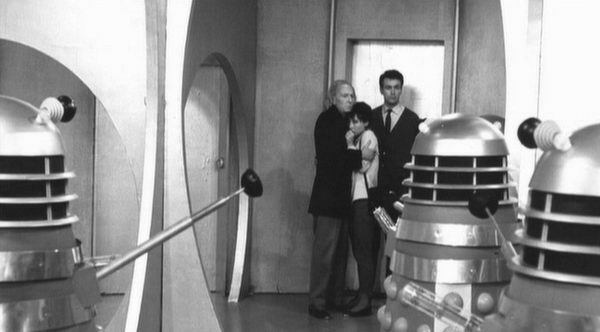 Who Jamie rescues from the Daleks, as part of a staged experiment to look at the resourcefulness of the human condition. At 7 parts, The Evil Of The Daleks is long and in some cases drawn out. It does however, hold many interesting ideas and moments. Including; the Doctor and Jamie trying to track the missing Tardis. Jamie’s rescuing Victoria experiment. The result of introducting human factor into Daleks and the trip to Skaro – to meet the imposing Emporer Dalek and the final war between the good and bad Daleks. The final battle between Daleks is utterly brutal, as the Daleks destroy themselves, their city – and their Emporer – in a civil war. It was intended to be their final appearance in the series and this is even confirmed by the Doctor – who afterwards, comment on their demise. The Evil Of The Daleks is unfortunately mostly missing from the Beeb archive, which is a shame for such an epic Dalek adventure, much in the vein of The Daleks’ Masterplan. It gives many memorable and cult moments, not least with the introduction of a Dalek Emporer (over the usual black domed Dalek leader) and final brutal civil war. It also revels in some fun moments, with the humanised Daleks questioning their Dalek master’s orders and playing games – for fun.